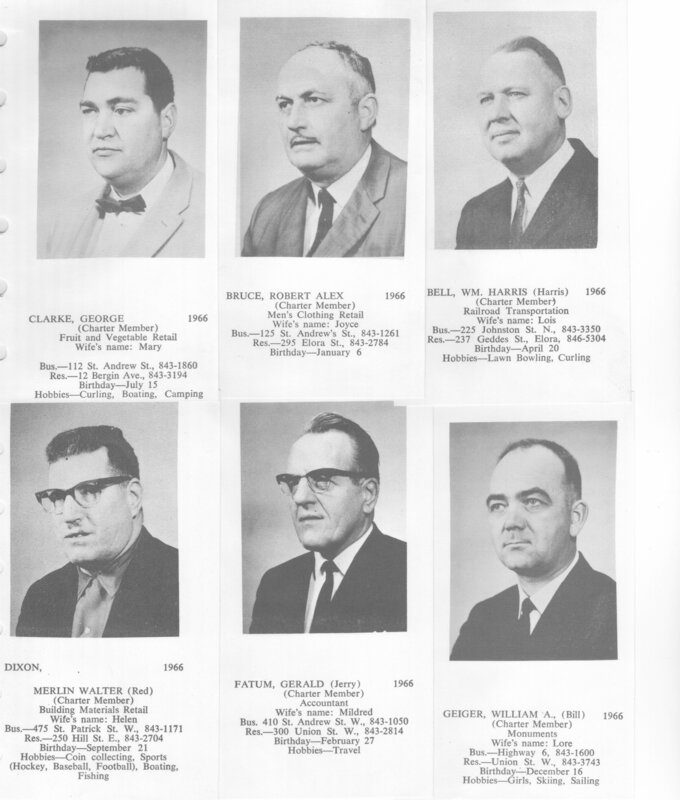 In the fall of 1965, Harris Steele, a former resident of Fergus and a Guelph Rotarian met with Fergus Clerk, Dave Low, regarding the possibility of Fergus having a Rotary Club. The Fergus Service Club had faded and there was a need for a service club. Dave Low and Mayor Jack Milligan expressed interest in Rotary and Harris Steele returned with Dave Kennedy a Past District Governor (707) to talk with them. Harris and David, supported by Guelph Rotarians John Arnold, Allan Wescott, and Pat O'Brien continued meeting with Dave Low and Jack Milligan who by this time were joined by Mario Landoni. These three approached the various local men and received an enthusiastic response and very soon twenty-five had agreed to become Charter Members. Several organizational meetings followed at the Fergus Motel and the Guelph Cutten Club. 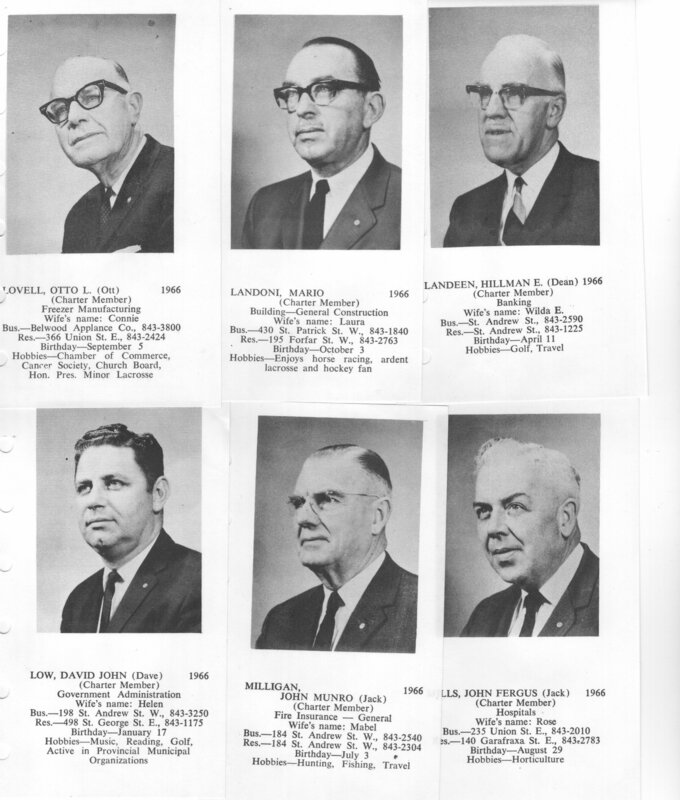 The Charter Executive included president, Emery Nelson: Vice-President Jack Milligan: Secretary, John Brown: Treasurer, William E. Landeen: and Directors, Dave Low, John Mills, Lorne Pattison, Bruce Peglar, and Guido Widmeyer. Cecil Wolfe later replaced John Brown as secretary. 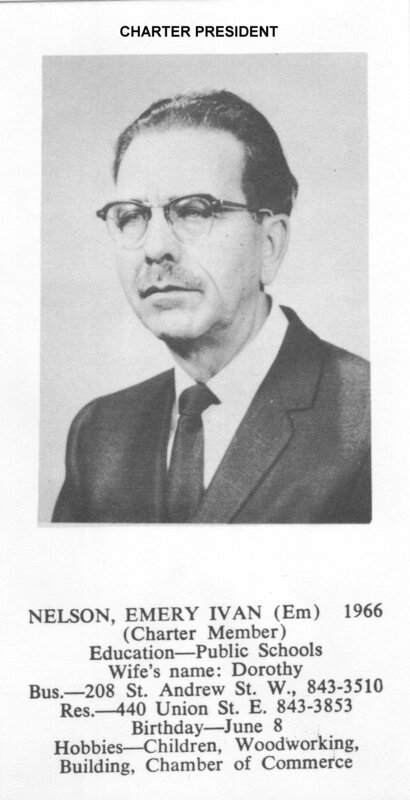 This executive held office from the initial meeting on Tuesday March 22,1966 at the Ionic Hall at 12:15 to June 1967. The Rotary Club of Guelph sponsored the Rotary Club of Fergus' Charter Night on May 26,1966 at Paradise Gardens in Guelph. In 1979 the membership of the club had grown and included many members from the areas surrounding Fergus including the Village of Elora. To recognize this the name of the club was officially changed in 1979 to the Fergus-Elora Rotary Club.